The countdown to Christmas is upon us and, for most families, the holiday season wouldn’t be complete without children and loved ones receiving their very own, personalised video greeting from Santa Claus and peak into the enchanting North Pole village. 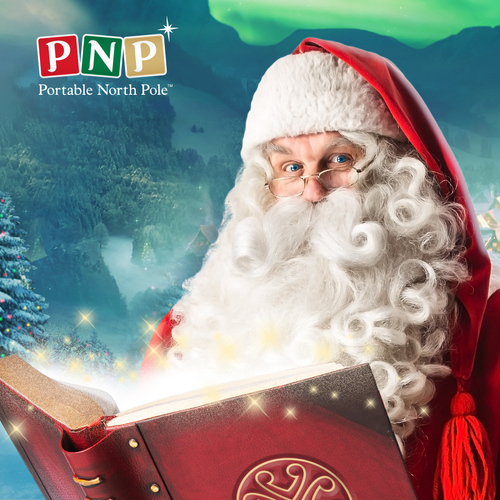 Now in its 11th year with more than 200 million personalised videos messages viewed worldwide, Portable North Pole (PNP) is an adored, modern tradition that brings the magic of Christmas to life by letting you easily create and send adorable videos and calls online or with the free mobile app. New for 2018 – An amazing Behaviour Update Video surprises children, who are hoping to be on Santa’s good list, with a personalised video from the big guy himself, only to have him ring them directly on the phone during the video to chat about their behaviour and they see it all happening live in the video. Also new, the Video Call enables children to see and chat with Santa on-screen. In addition, until November 20th, the new First Name Guarantee lets parents ensure the correct pronunciation for their child’s name is available for personalising videos. You simply share a few details (name, age, gift wanted, etc.) and upload favorite pictures at www.portablenorthpole.com or through the free mobile iOS or Android app. In just moments, an amazing, personalised, cinematic video where Santa talks to your child (or the young-at-heart) from his magical village in the North Pole is ready to send. Available in English, Spanish, French and Italian, PNP offers free video options for kids and grown-ups in late November. In addition, premium video/call packages, ranging from £2.99 to£3.99., come with unlimited access to multiple, unique, extended Premium videos with extra personalisation options and more. With the mobile app, the special Reaction Recorder uses your phone’s camera to capture the moment of joy and surprise when Santa Claus reveals whether your child is on his “naughty or nice” list – creating a cherished keepsake for parents. •	NEW – Video Call or Pre-schedule Phone Call from Santa (£2.99): Who’s that calling? It’s Father Christmas himself. Imagine your child’s surprise with they see Santa on-screen as they chat one-on-one with a Video Call, or watch them be amazed with a pre-scheduled phone call from Santa ahead of Christmas day or direct from his sleigh on the big night. •	NEW – First Name Guarantee: As a special pre-season offer with the Magic Pass, you can ensure your child’s name with the correct pronunciation is available for all videos and calls. Available in English, Spanish, French and Italian for video package purchases until Nov. 20th. •	NEW Lifetime Pass (£26.99): For parents who have lots of little Santa believers, PNP offers a new pass with unlimited Magic Pass access for ten years. Available until Nov. 20th. •	Magic Pass (£10.99): Comes with unlimited access to 11 premium videos and 29 calls or video calls, downloadable in HD, plus 24 wonderful holiday video stories that your kids can listen on the PNP mobile app advent calendar. Includes the new Behaviour Update Video and the Reaction Recorder (app only). You can also upgrade from a Magic Pass to Lifetime for just £16.99. •	Video Pass (£7.99): Choose from 11 premium, extended video storylines, each providing a unique, adorable experience to watch, such as the elf’s gift wrapping presents to working with the reindeer and more. It also includes the Reaction Recorder (mobile app only), ability to create an unlimited number of premium personalized videos, and a special “Santa’s Coming” video to watch on Christmas Eve. You can upgrade from a Video Pass to a Lifetime pass for £19.99. •	Individual Premium video (£3.99): Choose from and personalize any of the 11 premium video message scenarios with extended storylines. Each provides a unique, adorable experience to watch, such as the elf’s gift wrapping presents to working with the reindeer and more. •	FREE Videos: Every year, PNP offers free, entirely new Christmas and Birthday videos, to customize and send to kids and grownups. This year, the PNP mobile app kids section offers all kinds of fun games and activities. They can count down the days until Christmas with PNP’s special Advent Calendar video (included with Magic Pass), turn themselves into an elf or reindeer with Santa’s sELFies picture augmented reality overlays, play the Talking Elf game, receive a voicemail from Santa and more. Plus, check out Santa’s Village on the Portable North Pole website for even more activities that will keep kids smiling through the festive season. New, Award-Winning Toys Make The Holidays Even More Fun! PNP’s line up of award-winning, lovable toys and gifts that let kids enjoy the fun of the season before Christmas while encouraging good behavior are back again this year. The line includes the award-winning Do-Good Elf and Karamelli Santa’s Sweetest Baby Reindeer plush, plus the Santa Letter Kit and, Twenty-Four Sleeps ‘Til Santa storybook. NEW this year is Senoki Santa’s Snuggly Owlet Plush and the 24 Treats ’til Christmas Pop-Up Advent Calendar. Each toy includes a special code that gives you access to an exclusive personalized video from Santa. All are available now exclusively at John Lewis stores in the United Kingdom & Ireland, plus on JohnLewis.com.